People come and go in life. And the most hurtful separation always comes from some people whom we never could have guessed would be leaving. But at this rate, no matter how hard it is, the show must go on. EXO, used to be a large idol group with twelve members, but since June 2015, the boys have been carrying on with nine members only. The wolf pack has lost three betas, only three years after their amazing debut back in 2012. It’s heartbreaking for me as an EXO-L (the official fandom name of EXO). Therefore, for the next two posts (this one and the next one after this) in this month’s Male Special Part 1: Band of Brothers, I’m gonna write a review of EXO’s two hits which was released at their peak. Let’s start with “Wolf (늑대와 미녀)”. “Wolf (늑대와 미녀)”, released on June 3rd 2013, was a long-awaited comeback of EXO for their devoted fans. The hip-hop dance pop track was served as lead single from the group’s first studio album, “XOXO”. The album itself was released in two versions: a Korean “Kiss” edition and a Chinese “Hug” edition. “Wolf (늑대와 미녀)” was composed and arranged by Will Simms and Nermin Harambasic from Dsign Music, and Kenzie from SM Entertainment, who also penned the lyrics for its Korean version, while Zhou Weijie provided the lyrics for Mandarin Chinese version. Music video for “Wolf (늑대와 미녀)” was released on May 30th 2013 and premiered on Mnet. During the promotion for “Wolf (늑대와 미녀)”, EXO performed as a whole group instead of being divided into its two subgroups, EXO-K and EXO-M, like they had done before with their previous debut mini album. 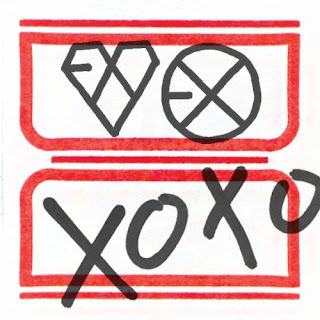 The album “XOXO” won Album of the Year at the 2013 Mnet Asian Music Awards and sold over one million copies, becoming the best-selling album in Korea since 2001. As it was very well-widely-received, it was a proof that the boys were indeed worth waiting back then.